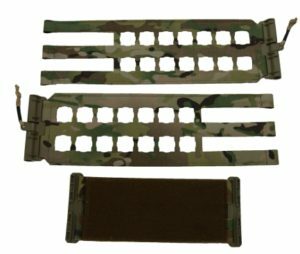 Beez Combat Systems has designed a Retro-Kit Skeletal L(Laser) cummerbund with Tubes. Designed for JPC style plate carriers. The unique laser cut shape makes accessing the pouch mounting straps easier by providing additional space. The Skeletal L(Laser) cut cummerbund is different than traditional skeletal webbing style with only one vertical support column. The design provides vertical support between columns. The Skeletal L(Laser) cummerbund is semi-rigid allowing for additional support for heavier loads. It also allows you to mount pouches on both sides with the unique design. Fits in PCs or Body Armor Carries that have a 5″ webbing pass through. Now available – a retro-kit Skeletal L(Laser) cummerbund system for your JPC style PC with Tubes.